Coverage: Up to 3600 sq. ft. I already have the smaller model that looks the same, but has less than half the water tank capacity at 2 gallons, and is not heavy enough when fully loaded with water to need any wheels. Love it. Love the new big one too. The big version is simple to operate, construction design makes it most unlikely to leak, it is quiet at low speeds and effective in a large space. Four speeds for the fan, as opposed to three on the small one, but it also has a speed marked A for automatic. This is a fantastic additional feature. The further the humidity drifts away from the desired setting, the faster the fan speed, and vice versa. No need to constantly monitor the humidifier and reduce noisy fan speed by hand. The MA 1201 does it for you. Recommended. I have an 1100 sq. ft. unit and this humidifier works perfectly. I set it on F1 so it's quiet. I live in Wisconsin and set it on 30 and during the winter everything is hunky dory. This unit was a replacement. Unfortunately they don't last forever. I change the filter yearly. Get generic ones off the Internet for about half price. They look exactly the same. I had new hard wood floors installed and then the weather turned cold and very low humidity. Unfortunately the wood started to separate in some spots. The contractor told me that the moisture was evaporating from the wood and it was shrinking. Checked that story out and it is true. Bought a small unit but had no affect. Saw this one on line and like the square footage coverage. Been using it for two weeks and have kept the humidity between 47-50%. The wood is expanding so needless to say I am very happy. Have ordered 2 of these and one for my parents. My parents arrived not working. Walmart was amazing! They send out the replacement immediately and allowed a few weeks for us to return the defective one. Since then all are working well, no issues at all. Very easy to use and keeps our dry Az home comfortably humid. This humidifier is much quieter than I expected. I put the humidity setting on and noticed that the display is very accurate in telling me the humidity level of my house. I have several humidity meters in my house and the one in this humidifier is better than most of the meters I have. And of course it shuts itself off and on depending on the level I set it at. My wifes sinus head ache's are gone. My skin has stopped itching and cracking. We cant believe how mutch water it is putting into the air. The humidity in the house has gone from 21% to 46%. 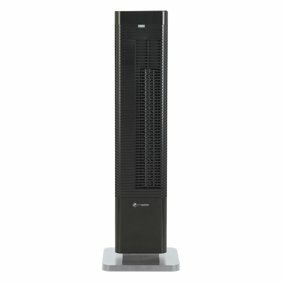 This unit puts out the specified humidity fast; much better than a "mist" type. Home has forced hot air (without a humidifier on the circulator); the heated air is very dry. This unit is keeping the house comfortable at the set humidity level (digital controls). Using about 7 gallons a day but keeping the humidity level with an outside temperature in the low 30s. Humidifier has good design; removable external fill tank is superior to type that fills from bucket. Auto humidity control seems to work well. I have some concern for durability due to lightweight construction of internal mechanism. This is the only whole house humidifier that I've used. It was used January to March of 2018 and the wick filter was replaced once and the humidifier cleaned. Now it's being used two months and the wick filter changed again and the humidifier cleaned again. The humidifier runs quiet enough, however, when the bottle is releasing water, it is a very loud gurgle sound, that can be heard throughout the two story house. It does the job keeping the air humid as it's set on. It's a good idea to also have a hygrometer to show the humidity level in each room or area of the home. We are glad you took the time to leave this review, even if we didn’t get all of the stars. It sounds like we have some room for improvement, so please reach out to us at info@essickair.com and tell us how we can help. Thanks. Upon arrival, I could not find the instructions as they are packed on the inside of the unit - the first step of them to open the unit and remove the instructions! No note or sticker on the outside of the unit to indicate this, you could easily fill with water and start using with the paperwork in the water tray. After about 2 days, the tray would start to overflow due to an air pressure leak in the tank. Found that wayfair.com only allows returns if you pay for shipping (won't use them again) and spent almost a week on the phone with product support sending photos and receipts to them, to get the product fixed. They eventually sent a replacement tank and cap, both of which were defective prior returns (it came partially full of water) with a visible defect in the inner fill ring of the tank and a torn off-center cap seal. Had to make my own fill cap seal and use plastic wrap to get it to stop leaking. Do not recommend unit and definitely do NOT buy from wayfair.com. They are NOT walmart (although they are owned by them) and do NOT have similar return policies. Be very careful buying on walmart.com. Unlike Amazon that will ship free replacements for defective units, they will not. Rate the unit a 2. Rate wayfair.com a 1.